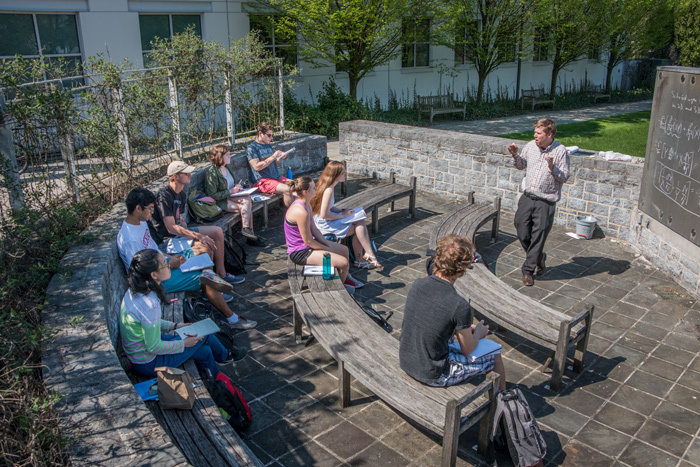 Dickinson is excited to offer a wide-ranging slate of courses during the summer of 2019. If you’re interested in anything from creative writing to renewable energy, from sustainable agriculture to acting, from ethics to microeconomics (and courses in 10 other academic areas), we’ve got something to enlighten, enrich and prepare you for the future. Current Dickinson students, students from other colleges or universities, qualified high school students and community members, just to name a few. Non-Dickinson students can contact reg@dickinson.edu for additional info. Please see the Summer Programs section of our Annual Fees page for costs. During the past fifty years, people have become nearly isolated from their natural environment. Fewer small farms, urbanization, the expansion of suburbs, air conditioning, mall shopping, posted land, less access to waterways, forgotten victory gardens and a host of other societal changes as created a generation that is suffering from Nature Deficient Disorder. Even the science of Biology has become more concentrated in the cellular and molecular realm than the field sciences. This course will explore the realm of field biology and natural history in the Carlisle area and familiarize students with some of the common forms of life outside the classroom. Being familiar with the organisms that compose ecosystems enables a student to have a better understanding of the principals of ecology everywhere in the world. Most labs will be outdoors. Some may require old sneakers to enter water. The overall goal of this course is to give students an understanding of the biology of marine communities. This includes principles of marine science, organisms of the ocean, structure/function of marine ecosystems, and the interactions between humans and the ocean. This course introduces students to contemporary debates in practical ethics. Course materials investigate how theoretical approaches to ethics apply to practical issues, including discussions of animal ethics, environmental ethics, reproductive ethics, civil disobedience, and the ethics of mass incarceration and the death penalty. This course is best suited for students interested in thinking about the relationship between ethical theory and practice, with an emphasis on how power, privilege, and responsibility intersect in our everyday lives. An introduction to global politics which examines the interaction of states, international organizations, non-governmental organizations, and individuals in the world arena. Topics covered include traditional concerns such as war, balance of power, the UN and international law along with the more recent additions to the agenda of world politics such as international terrorism, human rights, and economic globalization. RELG 101: What Is Religion? This course is a continuation of Spanish 102. The course focuses on all four language skills: listening, reading, writing, speaking, with increasing emphasis on writing and speaking. This course will cover the rationale, science, and practical implementation of renewable energy technologies available for use in residential, business, and developing world applications, including solar electric, solar thermal, biogas, biodiesel, wind, and microhydro systems. Curriculum will include readings, lectures, and exams combined with field trips and hands-on labs focused on designing, developing, and testing small scale renewable energy projects. This course aims to provide students with a full-spectrum experience in what it means to be a farmer and consumer in the 21st century. Students will explore the theories and practices of sustainable food production plus learn about the issues facing farmers and consumers, from field to farmers' market. The curriculum will include readings, lectures, and exams along with hands-on experience in food production, field-based research labs, and field trips.